LINCOLN — A picture of something will always struggle to have the prestige or nobility of the thing itself. Why? Because it is essentially just an echo of that thing. This is what Claudius was driving at, in “Hamlet,” when he asked: “Laertes, was your father dear to you? / Or are you like the painting of a sorrow, / A face without a heart?” A painting of a sorrow is a travesty alongside sorrow itself, is it not? The same is true of a photograph of a Civil War battlefield, a portrait of a loved one, or a picture of the prophet Mohammed. That is why, throughout history, makers of images — when their activities have not been censored or banned — have tried so hard to make pictures that are not mere reproductions or representations, but things in themselves. Many different approaches have been tested. Painters of Byzantine icons, for instance, were at pains to emphasize the thingness of their sacred images. In a different vein, Renaissance artists used every trick in the book, from single-point perspective to trompe l’oeil, to expand pictorial space into a credible illusion of three-dimensionality, one that was continuous with the viewer’s space. In the 20th century, abstract painters, from Malevich to Jackson Pollock, Barnett Newman, and Frank Stella, insisted that their paintings were more than mere reproductions of other phenomena. They were phenomena (things, events, creations) in and of themselves. More recently, Minimalism took an almost puritanical approach, banishing from art even the possibility of its being mistaken for anything but itself. But acknowledging its existence is a good start to getting your head around the work by the five artists included in “Drawing Redefined,” an intelligent if at times solipsistic show at the deCordova Sculpture Park and Museum. Organized by senior curator Jennifer Gross, it features works by Roni Horn and Richard Tuttle, two established stars of American contemporary art, along with Esther Kläs, who was born in Germany and lives in New York; Joëlle Tuerlinckx, who is from Belgium; and Jorinde Voigt, from Germany. The show hinges on drawing’s struggle to cast off its reputation as a medium in service to other things — inventing, describing, idealizing, modeling, mapping, explaining — and to attain the prestige of a thing in itself. Since drawing has for so long been regarded as what Gross calls “a handmaiden to artistic process,” this struggle can seem especially vexed. Many of the works in “Drawing Redefined” don’t look like drawings at all. They’re artworks most people would describe as sculptures, videos, or paintings. But Horn’s three impressive works look like drawings more than most. They’re actually huge, framed works on paper made by laboriously dissecting drawings of painted marks, then piecing them back together in different configurations. This makes them sound rather like “handmaidens” — a field recording is in service to some other end, after all. But in truth, they are confidently themselves, and quite riveting as such. 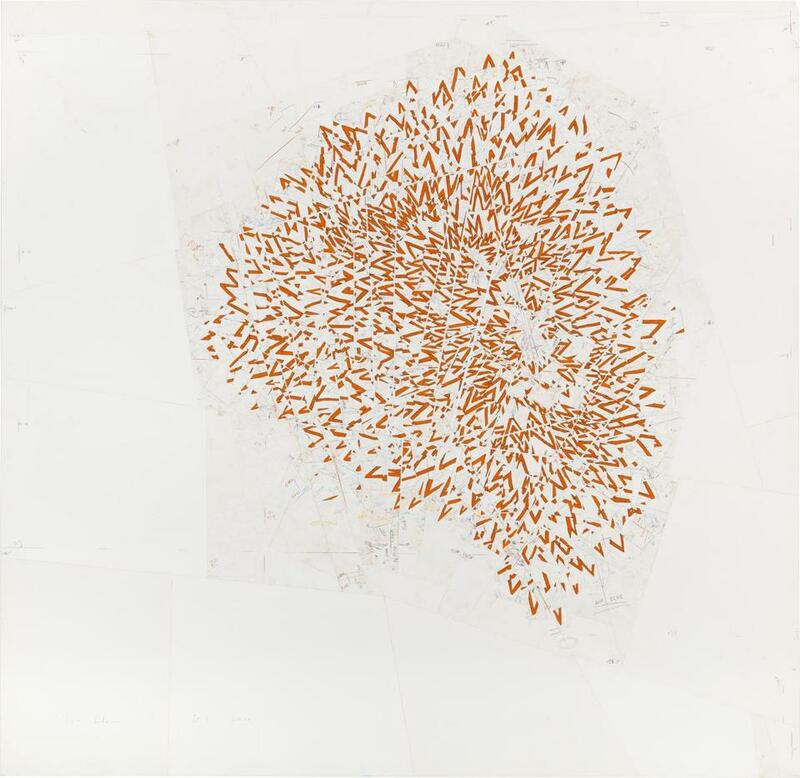 Another artist who covers her work in scrawled notations, like some cross between an alchemist, an astrophysicist, and Cy Twombly, is Jorinde Voigt. Her images, exquisite to look at, are also bewitching to the mind. Amalgams of diagrams, speculations, aide-mémoire, indices, abstract shapes, doodles, and writing, they remind us of all the things drawing can be, only to cut loose from all that. Voigt begins her works by literally laying herself out on a sheet of paper, thereby establishing, explains Gross, “the points of contact she will then mine between the pictorial field and the space of the world.” This “mining” process can be seen as a kind of energy transference, and it includes philosophic speculations, passionate outpourings, timekeeping, lines that describe orbital and wavelike motions, and various other representational modes. There is nothing static or final about Voigt’s works. They suggest that the same goes for our mortal existence. Even death is just a changed state. In the same gallery, the sculptor Kläs’s big ink-and-colored-pencil drawings are an attempt to draw “toward” sculpture. They are not, in other words, preparatory studies so much as attempts, by means of processes that take time and occupy space, to come into their own reality. I am not sure how well they succeed. Despite their ambitious scale, there is something at once slightly flimsy and over-familiar about them. They lack interest as objects in themselves. Many of the claims made on their behalf — that “the viewer’s participation completes” them, for instance — sound fine, but could be said just as easily for every other artwork. Tuerlinckx’s drawings are more radical. Combining sculpture made from found objects with assemblage, collage, video, and a compulsive collector’s impulse, they are the products of an artist who is hyperaware not only of her materials, but also of the social and institutional context of their display. They are so self-conscious as to be confounding. This could easily be maddening, but it’s exactly what I grew to like about them. 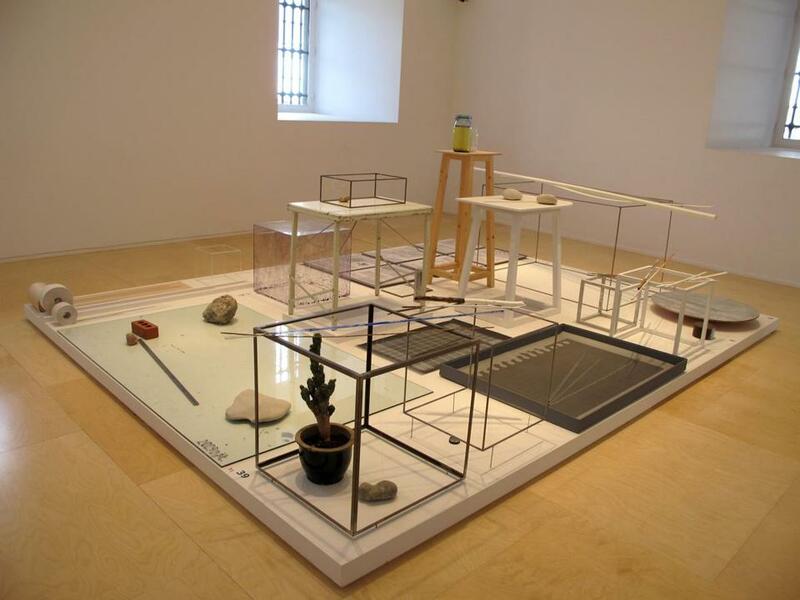 Tuerlinckx’s high metal table, on the surface of which are arranged five small stones and two glass panes attached at right angles, is one of the show’s key works. As you circle it, the glass creates reflected images of particular stones even as its transparency allows us to see others “as they are.” Time, space, perception, and representation all merge into an inseparable whole, and it is not so much the “drawing” that has achieved the status of a thing in itself as our experience of it. 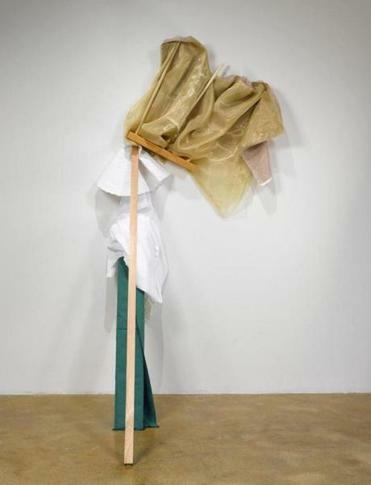 Richard Tuttle, whose work, according to Gross, was a primary inspiration for the whole show, is represented here by three pieces. All are sculptural, but Tuttle sees himself as “drawing space.” One, the beautiful “Flower,” is made from painted plywood. The other two combine wood, paint, and fabric. By occupying space where the wall meets the floor, they draw the viewer into an unexpected perceptual relationship. Tuttle’s works are improvised, fragile-looking, and conspicuously modest. They don’t cry out, “Look at me!” But they have a kind of magic that, through Tuttle’s nuanced understanding of shape, color, pattern, and space, pulls you in. What is the source of this magic? In the end, it can only be attributed to the success with which they achieve their own convincing reality. At deCordova Sculpture Park and Museum, Lincoln, through March 20, 2016.